Home > Chester News > Spooktacular Showcase! 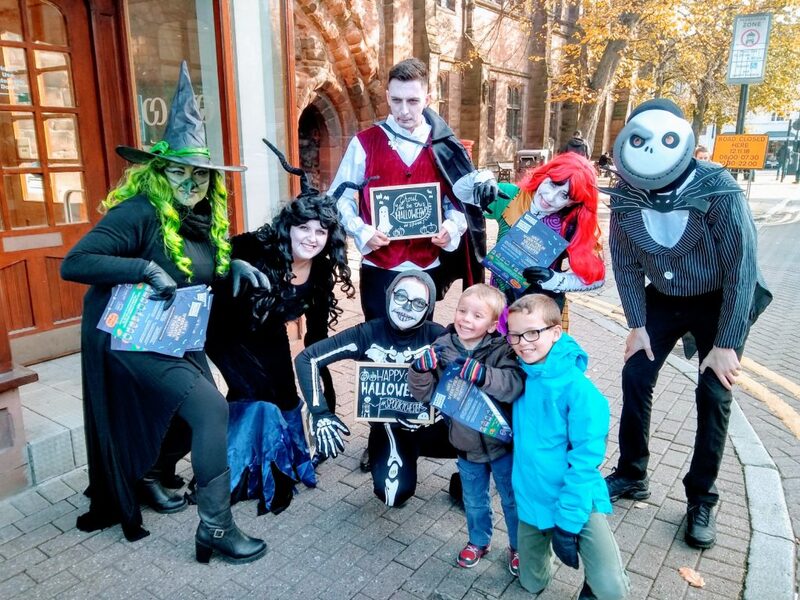 A ‘fangtastic’ range of free events were held in Chester city centre this Halloween to help families get in the spooky spirit and act as a showcase for upcoming Christmas shopping season. This year’s Ch1ChesterBID Spooktacular Trick or Treat Trail has proven to be a massive success! Nearly 50 businesses took part in the largest city centre trail to date, handing out over 10,000 sweets to terrifying trick or treaters between 27th-31st October. Whilst on the trail, children were asked to find spooky symbols to be in with a chance of winning a £50 toy bundle kindly donated by Debenhams in Chester. The winner was an eight year old girl and her little sister who visited every location! “My sister has just moved to Chester so this was the first time we really spent time here. It was a lovely way to explore the city. We never would have got our kids in and out of all the shops if they weren’t so excited about the trail. We only planned on doing a few shops buy they got so into it that we ended up doing them all!” said the Mum of this years winner of the Trick or Treat Trail, Shrewsbury. “The success of this years trail is down to the businesses who took part. Having so many of our city centre businesses join the trail really gave visitors a unique and positive experience in Chester. It was great to see so many city centre businesses and stakeholders come together to create such a diverse programme of activities which included free film screenings, free craft workshops, ghost tours and much more!” said Emily Ghazarian, Events Manager at Ch1ChesterBID. Don’t take our word for it, here is feedback from just some of those who took part. “I’ve lived in Chester for years but found myself googling loads of shops to find those on the trail. I didn’t realise how many shops we really have.” Dad of two talking about Lakeland Leather. https://experiencechester.co.uk/HALLOWEEN/ or follow @CH1Chester and #CH1Spooktacular on Twitter. The post Spooktacular Showcase! appeared first on Experience Chester.